Note: Staff also submits work requests electronically to the departments, therefore, the statistical data is an estimate of requests made and completed. The general public may also submit online complaints and requests on the Parish's webpage: http://www.tpcg.org utilizing the "Online Services" tab at the top of the page. CHRISTA DUPLANTIS-PRATHER is a life-long resident of Terrebonne Parish. She is married to Charles Prather and the daughter of Floyd and Robena Pertuit Duplantis. Christa is a Louisiana State University School of Nursing graduate and practicing registered nurse. Her desire and dedication to serve the people of Terrebonne Parish began in 1996 when she was elected to serve the residents of District 4. 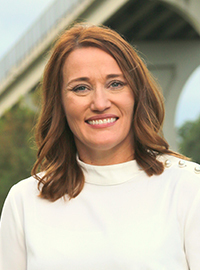 Christa represented the residents of District 4 for eight years and after the 2000 Census Redistricting/Reapportionment Plan adoption, she was elected to serve the residents of District 5 in 2004 completing a consecutive three-term tenure in office. Due to term limitations, Christa would have to wait four years before being re-elected in 2012 and is currently serving her second term of office. She maintains an active involvement in the community by serving as a member of various national and local committees as well attending monthly Neighborhood Watch meetings in District 5. Some of her civic involvement includes: an alumni of Leadership Terrebonne Class of 2012, The Haven, and Friends of the Terrebonne Animal Shelter. Christa has been named one of Louisiana's Great 100 Nurses and is a member of the Emergency Nurse Association.